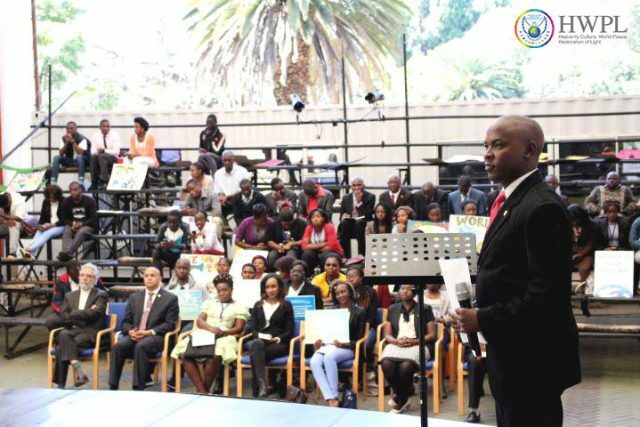 Harare, Zimbabwe – On the 4th of June 2016, IPYG, the International Peace Youth Group alongside numerous youth groups and educational institutions hosted the 3rd Annual Commemoration of the Declaration of World Peace at the Harare Gardens. Showing their commitment for peace, youth from the Female Student Network, Global Youth Foundation, and Centre for Peace and United Theological College all came together to help promote global peace advocacy through the Legislate Peace Campaign. The campaign was recently launched to bring all wars to an end by establishing an enforceable law compatible with the Declaration of Peace and Cessation of War (DPCW). The speakers include Mr. Claris Maduku, Director of The Platform for Youth Development Trust (PYD), Ms. Chido Mpemba, regional representative of Peace is Possible and Dr. Mohsen Shojakhani, the Cultural Counsellor of the Cultural Center of The Embassy of the Islamic Republic of Iran. It represents the voices of all those who yearn for peace and urges States to protect their citizen’s rights to enjoy peaceful lives. The “Legislate Peace” Campaign calls on global citizens to unite as one to speak out their positive demands for peace by adding their signatures. Around 500,000 signatures were collected through on and offline peace law platforms worldwide, in approximately three months. Marking the 3rd anniversary of its proclamation, the Declaration of World Peace has seen its fruit through the DPCW. The Declaration of World Peace Officially proclaimed at 5.25 Peace Walk at the Peace Gate, the Declaration of World Peace is HWPL’s vision for sustainable peace. We ask them to do this from a spirit of deep-stead love for the people of their country.